Innovation plays a significant role in Dell EMC’s midrange product strategy as we solve customer problems, lower costs, and drive customer satisfaction. Innovation is the reason customers helped grow Dell EMC Unity to more than $2B in sales and officially shipping over ONE Exabyte of raw flash capacity since its debut in May 2016[i]. Customers recognize Dell EMC Unity helps their businesses grow in today’s competitive markets. At Dell EMC, we understand that product quality, reliability and investment protection are critical attributes to our customers and partners. We remain committed to address these attributes and help customers accelerate their IT Transformation goals. The technology capabilities in Dell EMC Unity consistently enable businesses to rapidly respond to change and grow without interruption. Whether your company is coping with availability, performance, data protection, security, multi-cloud agility, or a variety of other challenging business demands, Dell EMC Unity is built to address all of these and more! With the new Operating Environment (OE) 4.4 software release, Dell EMC Unity provides a complete complement of array-based replication with MetroSync for File. All synchronous and asynchronous block & file replication options are now included with every Hybrid and All-Flash configuration. Nothing else is needed to ensure continuous operations of applications with rapid recovery and automated failover for both planned and unplanned events. These replication options combine to improve transactional application data RPO and RTO. Whether the operational need is for file or block, synchronous, or asynchronous replication, Dell EMC Unity supports it. How much data services software is needed to store, manage, and protect data, or move data to the cloud? Dell EMC Unity’s all-inclusive software provides everything you’ll need – at no additional cost. While some vendors have expensive add-on software licenses, Dell EMC Unity includes all software, including RecoverPoint for VMs and AppSync. Inline compression and deduplication are included too, providing maximum data efficiency. Dell EMC Unity includes CloudIQ, a native cloud-based application that uses predictive analytics and machine learning to proactively provide a comprehensive health score for each array. This helps customers identify and understand potential issues in their storage environment. We know that array element managers are essential for routine operations such as configuring and managing your storage. Unisphere for example provides deeper layers of information that support the daily management of data and physical infrastructure. CloudIQ can take proactive array monitoring to new heights, and is updated monthly to bring you a regular cadence of new capabilities. 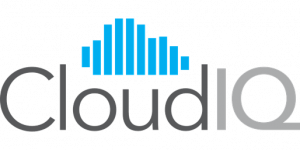 CloudIQ collects performance, capacity, system, configuration, and array protection data to instantly analyze and provide information about the health and status of the array. Information such as performance anomalies, capacity planning statistics and efficiency ratios are just a few of the insights you’ll get from this zero footprint, highly intuitive, browser-based application. CloudIQ provides administrators technical details about what is happening in their storage environments and how they can optimize for the best return on their investment. Your Dell EMC Unity investment is architected to always work 24×7 for your business. Being a a true active-active architecture means both controllers are active and serving IOs and accessing the drives concurrently from each controller. This simply means continuous access and optimizing your investment while you access the data without concern for availability or performance. 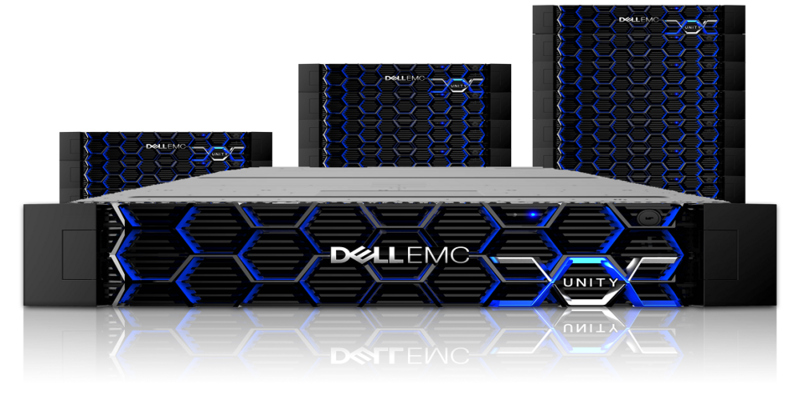 As a customer, we’ve even made it easy to upgrade your Dell EMC Unity fully online when you need more capacity and performance through data-in-place upgrade support. After all, architecture matters! 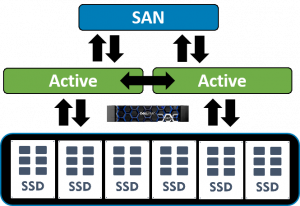 What Else is New in Dell EMC Unity OE 4.4? Midrange customers have evolved to a point where they need much of the same sophisticated and innovative solutions that large global enterprises use to store and manage data. Dell EMC Unity has been designed to be a complete enterprise-class solution with exceptional economics and flexibility to help our customers modernize their data centers and transform IT. Our product development is focused on solving your business challenges, and we’ll provide solutions that are automated, intelligent, flexible, and economical. Unrelenting attention to our customers keeps us #1, guides our development, and ultimately unleashes a product portfolio that’s hard to beat.